For this taste test I included three items: HoHos, Yodels and Swiss Rolls. Although this was crushed, I did appreciate the softness of the cake. Ethan and I both found the creme to be nice and smooth while the cake was just okay. The texture was good but it lacked any real chocolate flavor, even though it smelled very chocolaty. The Yodel stood up to whatever smooshed the HoHo (they were in the same grocery bag from the store) and when we tasted it, we knew why. The cake was pretty dry, we needed to drink plenty of water with this. The creme was a little dense, but has a decent flavor. Any enjoyment of the flavor was overshadowed by the dryness of the cake though. The outer chocolate coating seemed almost plasticy too. I was disappointed in the Yodel, I remembered liking them a lot when I was a kid. The cake was dry and there was not a good creme-to-cake ratio. The middle of the road roll would be the HoHo. It was much better than the Yodel but still seemed to lack the satisfaction one would expect consuming these calories. Our top pick was the Swiss Roll. To me, Little Debbie usually knows what she’s doing. I’ve enjoyed her products through the years, and she does not disappoint with the Swiss Roll. It’s crumbly but that’s because it’s so moist and delicate. The taste makes it the most worthy of the three. What a great new blog! As a fellow blogger of junk food (and other strange eats) I welcome you. I haven’t eaten Swiss Rolls in years, but the sight of them brings back so many childhood memories. I remember peeling off the icing and eating it first. Ha. That reminds me of how I used to eat Hostess cupcakes when I was young. I’d eat the frosting first, then I’d eat as much of the cake as I could without “damaging” the filling – which I saved for last. It was kind of stupid and very messy, but the filling was the best part to me and I wanted to experience the flavor in its pure form. I used to love Hostess Big Wheels. Same ingredients as a Ho Ho only round. 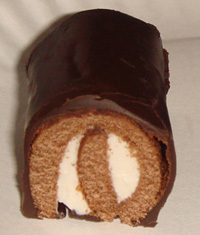 swiss rolls are the best of the three, but whatever happened to chocodiles? they were my absolute most favorite! I used to make my mother so mad by shoving my little fingers into the swissrolls to dig out the creme and then throwing away the cake part What a little freak I was. What a shame to see the Yodel do so poorly. I too recall LOVING them when I was a kid. I suspect it may have something to do with being a Hostess product now, considering how the Ho-Ho did in your poll. Interesting that they’d be so different. They all look the same on the packages. You people are crazy to say that any of those are better than Yodels… the Yodels are the finest chocolate product on the market. I enjoyed Yodels in New York in the early sixties. They were wrapped individually in a shiny silver wrapper. I have been in South Carolina since 1966. Yodels have not been available here ever. Little Debbie Swiss Rolls have been a good substitute, and according to this neat site, even better. These yodels are not the originals and don’t taste as good. I also ate the originals in silver wrapper in the sixties in NY. does any body know if any store makes any of the originals. It’s all a matter of preference. Swiss Rolls are really a good bargain for what they are. I just prefer Yodels regardless of price. I remember JELLY YODELS and YODELS that were individually wrapped in BLUE AND SILVER wrapping back in the 1960’s ……… does anyone else remember that? The yodels of the 60’s were the best ‘cupcake’ ever! I can still remember the taste.In the tv commercial back then,they say ‘can you do a yodel?’,which ment can you eat a yodel in one bite? The yodels today are total crap! I guess it’s all the chemicals they use today. And does anyone remember the original ringdings? Twice as big as the jr’s.As for today,Hohos are the best. I haven’t been able to find hohos or yodels in my area, and I have been looking- just ring dings and they are fine. It’s mostly Tastycakes and some Entenmanns in my neck of the woods. As far as Little Debbie products, I don’t know about their swiss rolls, but their muffins are absolutely awful, and in my experience, other products by that company are just dry and poorly made. Someone recalled Big Wheels- I think they had milk chocolate instead of the dark chocolate like Ring Dings. None of it today tastes as wonderful as it did years ago, and I’ll bet that like most everything else, is smaller in size and has more chemicals. I grew up with Swiss Rolls, every since I was I child my mom would give me 25 cents and I’d buy a pack before school. I never liked the other brands because they were too expensive and when I did buy them, they tasted like a fake version of Swiss Rolls. 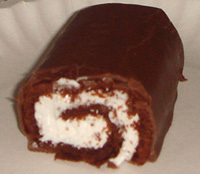 Little Debbie’s Swill Roll wins this round easily but the best cake ever, and is no longer being made, was the Drakes Swiss Roll. It was about two and a half times the size of the cakes reviewed here and did not have an outer chocolate coating and the cream was very sweet and almost crystal sugary. There are multiple web sites asking Drake’s to bring them back. They were not hugely popular, but like the Sunny Doodle they are very missed. 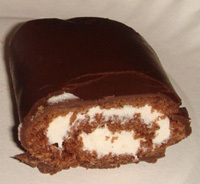 Hostess remade the chocolate in the Ho-ho. I think it is now the best of the lot. OF course this review is 8 years after the original post. Yes, the original yodels were most awesome! They where wrapped individually in blue foil which kept them extra fresh. They were delectable little treats, especially after school, that you could peel off the chocolate wonderfully if you so desired, unroll and eat the icing if that was your style, or just devour in a tasty blitz. Which ever way they went down, it was the blue foil that mattered the most. It was the ultimate protector of the immense goodness. However, as all good things eventually come to an end, and nothing lasts forever, Wikipedia clearly states that with buyouts and changing of hands, the original recipe and foil wrapper was sadly altered in the 1980’s for reasons unknown of a modern society. I moved to north Carolina in the mid seventies and never saw them again. Later on I would look for them in the grocery or convenience stores but to no avail. The memory of the blue foil and tasty treat as clear as the blue sky of the day. And then, out of the blue, low and behold, in the local Wal-Mart there they were. A box of drakes Yodels. But sadly, it was not to be. Changed and unrecognizable from the original, no foil, and just about like the other two mentioned where these comparisons are concerned, it was ultimately a sad day where yodel folklore was to be relived. It’s kind of like taco Bell getting rid of those great sauces from the 1990’s and any memory of any great thing! How dare anyone compare the other two w Yodels? They are sublime in their ability to cause a sugar-induced coma oh so softly…. I just ate a Swiss Roll which sparked me to research to see what other thought was the best between the Swiss Roll, Yodel, and Ho Ho. I’ve been enjoying Yodels since the 90’s and never had the pleasure of eating the original. Regardless Yodels are by far on a different level. The Swiss Roll was to soft, hence why it got smushed so badly in Ethan’s grocery bag. Yodels are great because they can be peeled apart with your teeth to fully enjoy individual sections of the yodel desired, rather plot the whole thing in your mouth. Mrs. Freshley’s Swiss rolls the absolute worse. So sweet and non chocolate tasting. I’ve never even heard of a ho-ho until now. That’s how you know it should be at the bottom. The only true Swiss Roll was the one made by Drake’s (no longer made 🙁 ). They were three times bigger than Yodels and Ho Ho’s, had more creme filling, and did not have the chocolate icing. Only 4 would fit in the same size box as 12 Yodels or Ho Ho’s. There’s even a Facebook page called Let’s get 1,000,000 people to bring back Swiss Rolls. If only.